This blog post will deal with the view on Enterprise Architecture and Innovation that Chris Potts presented in his keynote at the the ITU the 24th of February 2010. The first generation strategy was focused on technology (this was the early beginning) which took place in the 70s, 80s and early 90s. The second generation strategy the managers changed the scope from the technology to IT efficiency since they wanted to control the cost of strategy. This happened in the mid-90s and the end – 90s. The organizations outsourced expensive technology and operations to companies that where better keep the cost down. The third generation is characterized by the managers are focusing on how to create value by using technology and incorporate the IT strategy into their corporate strategy. The fourth generation is dealing with investing in change and not focusing on technology since it is embedded in the organization. The Investment managers and the Enterprise Architecture will be dealing with the change and the adaption of the organization and technology. When it comes to the third and fourth generation then the managers have to focus on applying theory and concept of Enterprise Architecture to investigate the current state of the Enterprise Architecture (“AS IS”) and how the Enterprise Architecture should be transformed (transformation plan) into fulfilling the strategy. Chris Potts focuses on the promise of a strategy (e.g., We will be the largest ICT supplier in Great Britain within two years) and the Enterprise Architect (in our case the Coherency Architect) should put his or her attention on developing a transition plan that enables the employees and management of the organization to achieve the strategy. Why a company needs to innovate its Enterprise Architecture and what Innovations should an Enterprise Architect recommend. It is notable that Chris Potts made use of a case titled “SpaNets”. The Global Economy has lead to a price lead competition and the EA analysis (“AS IS”) can assist the enterprise in innovating its processes. The enterprise can use the Enterprise Architecture to give them a proper view of the subsidiaries the the organization has acquired. The enterprise can use the Enterprise Architecture to document the processes to align them or to apply standardized business processes. You can argue that an organization has a functional enterprise architecture by judging it on its ability to generate a surplus. Chris Potts defines the concept of Enterprise Architecture as system where the animal spirit of the founders of the organization are combined with the structure of systems within the organization. “Enterprise is defined on a bold or courage undertaking and the animal spirits of the entrepreneur. The architecture is the science of designing structures and a style of structure.” – Chris Potts, The IT University of Copenhagen, 2010. Never the less the concept of the Enterprise Architecture is more than just dealing with the configuration of systems within systems or architectures within architectures. First of all is Enterprise Architecture about people. “Enterprise Architecture is about people” – Chris Potts, IT University of Copenhagen, 2010. This makes sense since the enterprise architecture consist of labour, land and capital (resources) combined with strategy and it matches the focus of knowledge management as Nonaka dealt with it in his knowledge spiral. Knowledge is acquired (in tacit form) form the individual who either socializes or externalizes it. 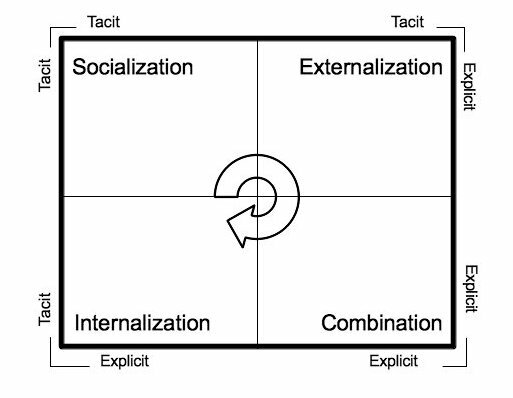 When the knowledge is socialized or externalized then the organization (or the enterprise can apply it or crystallize it). One imperative for the Coherency Architect is to create space for the employees of the organization so they can use their creative skills to create innovation. This focus can be supported by the theory that Gary Hamel proposes in his book titled “The New Age of Management” from 2007. Gary Hamel argues that the employees of the organization should be enabled to create their own projects within the framework of the organization and the organization should promote that the old management orthodoxies should be banished. “When you are an enterprise architect it is all about people, space and purpose.” – Chris Potts, IT University of Copenhagen, 2010. When the Coherency Architect is designing the “TO BE” Enterprise Architecture then he or she should focus on the customers since the dilemma often becomes if the enterprise owns (has a process) or the customer owns a process and who exist for who. “has the company a process or is it the customer who has a process” – Chris Potts, IT University of Copenhagen, 2010. When it comes to processes and architectures in the enterprise then Chris Potts states that most companies are aware of managing the Systems and Technologies architecture but they haven’t managed or designed the rest of the architectures. “All but the technologies architecture are rarely defined or actively managed” – Chris Potts, IT University of Copenhagen, 2010. However in most organizations the Coherency Architect will most certainly face a political situation when or if he or she goes to the CXOs and informs them that the organization’s Enterprise Architecture isn’t matched with the strategy and principles of the organization. “It takes courage to go to the executive suite and tell the executives that we found out that the company is broken” – Chris Potts, IT University of Copenhagen, 2010. The Coherency Architect should therefore focus on change management principles as well as using the corporate strategy as a key driver to convert the resistance among the CXOs to assistance in the transformation process (making them change agents). When it comes to EA approaches and methods then an Coherency Architect group might phase the issue of defining what artifacts that should be interpreted as what and how these should be organized; however in the end the Coherency Architects should focus on making something useful and that is where the strengths of knowledge management and innovation becomes useful. “We had 15 people and we got 15 answers on what Enterprise Architecture was an should be. […] We all see it as something different; however what matters is that we had to boil it down to something useful ” – Chris Potts. However it is notable when the organization starts to mature its enterprise architecture then an EA program has to be imitated and the Coherency Architect needs to be hold accountable to achieve the strategy and by defining the principles of which the Enterprise Architecture strategy needs to be implemented by. As mentioned in the blog post “The IT Strategy: An Articulation of the IT Strategy from a Coherency Architect’s Point of View.” then Chris Potts advices that the strategy needs to be embodied by the strategist (in our case the Coherency Architect) and the de facto strategy is not the one mentioned in the articulated strategy. The conclusion of the keynote was that Enterprise Architecture can be used to identify problems within the Enterprise. In the same time can Enterprise Architecture applied to gain a competitive advantage for the enterprise.Thereto should Coherency Architect identify the constraints of the organization before initiating the Enterprise Architecture transformation program. Then identify how the value can be created by using the technology available if not to mention how create a combined strategy (EA strategy) for the enterprise that both focuses on keeping the animal spirit of the founders and enabling the employees of the organization to innovate. The enablement of employees to innovate is an imperative since Enterprise Architecture is about people. The Coherency Architect has to show courage when it comes to inform the top management on misalignment in the Enterprise Architecture and in the same time be able to compromise with the rest of the Coherency Management Group in defining the proper solution for the enterprise. When the Enterprise wants to benefit from its Enterprise Architecture then it has to initiate an EA program to mature the enterprise since only through the EA approach will the organization be able to activate the proper synergies among the various components that the organization consist of. The Coherency Architect has to focus on the strategic promise he or she articulates (the promise is a single line that includes a statement for what the enterprise should be) and the de facto strategy the Coherency Architect implements. If there is a misalignment between the two then the strategy needs to be redefined and reimplemented. The Coherency Architect needs to challenge the orthodoxies of the enterprise and the industry of which the enterprise operates to release the true potential of Enterprise Architecture. The Front Lines of EA (2): An insight in to Strategy and Innovation. Previous The IT Strategy: An Articulation of the IT Strategy from a Coherency Architect’s Point of View. Next Economic Benefits of Enterprise Architecture: The Coherency Architect’s Economic Toolset.